Teo noted that she has given the sector the marching order to focus on the promotion of Faith-based tourism products in the different regions of the Philippines, the only Catholic country in Asia. Among the destinations and activities mentioned by the Tourism Chief are the shrines of Ilocos Norte, Ilocos Sur, La Union and Pangasinan, all of which are on the list of top recommended faith destinations in Region I, where the Nuestra Señora De La Asuncion, a UNESCO World Heritage Site, is located. 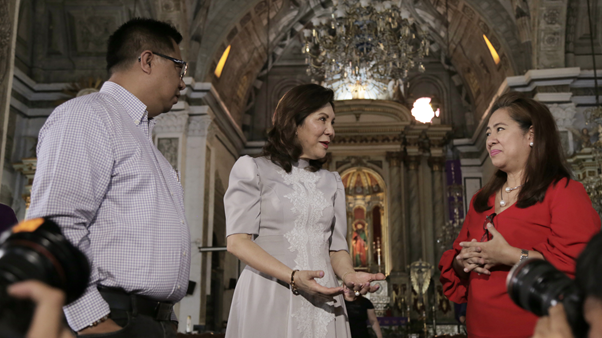 For pilgrims who are to partake in the Visita Iglesia in Cagayan Valley, Teo noted that the region has created packages highlighting religious excursions in the provinces. "Region IV-B MIMAROPA is known for its famous Moriones Tableau, a century old tradition in Marinduque staged during the week-long celebration of the Holy Week, where locals would perform a re-enactment of Christ's passion and death, with Longinus as the other central character, showing a glimpse of the province's religious history." Teo likewise noted that Western Visayas highlights the unique Holy Week celebrations in Bacolod City, Talisay City and Valladolid while Bacolod City is known for "Kalbaryo sang Krus", a street drama portraying the suffering and death of Jesus. She invited tourists to visit the shrines and churches of Misamis, Lanao, Bukidnon, Camiguin in Northern Mindanao. "The Sunken Cemetery of Camiguin is a must-see for tourists and pilgrims alike, as well as the St. John the Baptist Church, a known heritage site in Misamis Occidental. The region also celebrates a number of religious festivals for the Holy Week celebration, namely the Feast of the Divine Mercy, Hinuklog, Panaad and Patunob Festival," enthused Teo. "It is interesting to note that Dipolog City in Western Visayas will be staging its annual Katkat Sakripisyo on Good Friday, a depiction of the passion, suffering and death of Christ in Linabo Peak, where pilgrims will complete the 3, 003-step katkat (climb) until the last of the 14 stations of the cross." Meanwhile, Metro Manila residents who want to avoid the exodus of travelers going to the provinces, may opt to visit Intramuros where the Visita Iglesia, Senakulo and Via Crucis will be held from March 29 (Maundy Thursday) and 30 (Good Friday), said Atty. Guiller Asido of Intramuros Administration.